Not quite correctly. The IP is different maybe because the CPU executes the next instruction before taking the NMI and "SPEICHER-SEGMENT" is the contents of port 0xf842 and I'm not sure what it is (possibly the high 8 bits of the faulting address?). The major difference between the two machines is the installed RAM ... my real PC-D has 1MB ... CHKDSK shows 917504 Bytes RAM, 852000 Bytes free, the emulated PC-D has only 512K ... they came in 256K, 512K and 1MB configurations. Last edited by rfka01; 10/09/15 07:00 PM. Last edited by Heydude; 10/18/15 03:32 PM. Any generic DOS version should work on the -05. The -11 is a different beast with a different bus architecture, I can't help you with that. This archive https://dl.dropboxusercontent.com/u/55419307/Siemens%20Sicomp%20PC16-05.rar contains ROM dumps and photos of my PC16-05 as well as a bootdisk created from the DOS 3.3 on its harddisk. Uh oh ... if it's standard XT compatible hardware, it will not really help, because of the non-standard PG-685 hardware ... so PC16-11 and may be PC16-20 is the key (because these are definitely non-standard...). It would be great to have the PG-685 included, so if you can contribute ROM dumps, disk dumps, photos and documentation, you're most welcome! I'd love to see another Siemens machine added, after all a lot of Siemens PCs were built in my hometown of Augsburg (dunno about the PG-685 though). 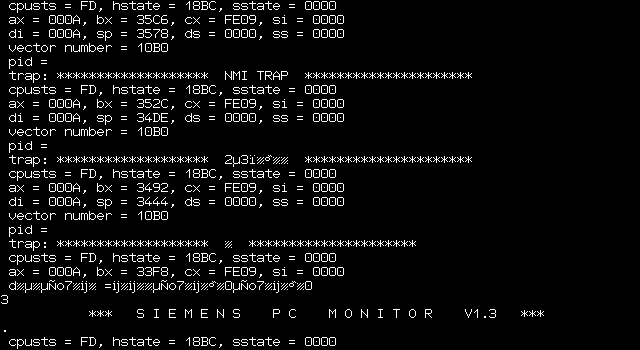 Here's the Siemens PG-685 MS-DOS 2.11 disk image (sector by sector, no header nor any compression in image file itself). I hate this, if someone uses a special software for making raw disk image copies but it's not necessary (e.g. for MS-DOS disks). If "rawwrite for Windows" is not available, use my self written DOS utility for restoring the image. Revisiting the PC-D driver as I got hold of a collection of disks: If you install a harddisk from scratch using an original bootdisk, there are two mandatory reboots: One after the low level format using HDINIT, another after creating a partition in FDISK. Both times, the reboot ends in MAME only showing a cursor in the left top corner (same after a reboot using F3), a Shift-F3 reboot is needed to proceed. I don't remember this behaviour after the driver was becoming functional, so maybe it's a regression. There's definitely something broken. An old installation of Sinix 1.2 wouldn't boot on the PC-X driver, and while a new installation copies all disks to the harddisk, after the reboot, error messages (the NMI ones you can see in the screenshot) quickly run across the screen, until the monitor is started. Try reverting https://github.com/mamedev/mame/commit/3bb6c2b58656f8afedb3a1f6a69280adf957bd1b . Otherwise try finding out that last version that worked. Edit: Just tried my old install of 1.0, didn't work until I realized I hadn't set the MMU properly then it booted fine. Even if that isn't the problem you (maybe it's a 1.2 specific issue) we probably ought to put a writeup somewhere for people who want to try it out. Last edited by crazyc; 10/03/16 01:19 AM.